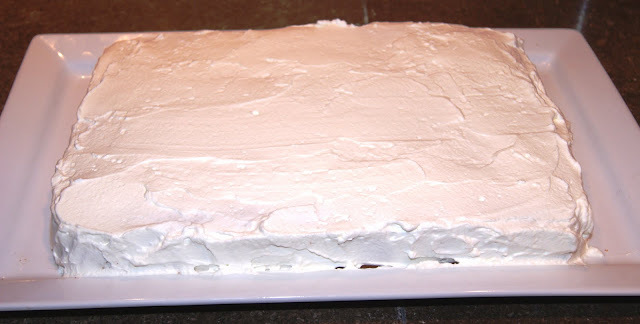 My first encounter with meringues was at my aunt's house, where she had purchased some Trader Joe's meringues for one of my families visits. We went through the entire tub in no time. They are so tasty. Meringues are one of these things that seem so much more fancy than they are. 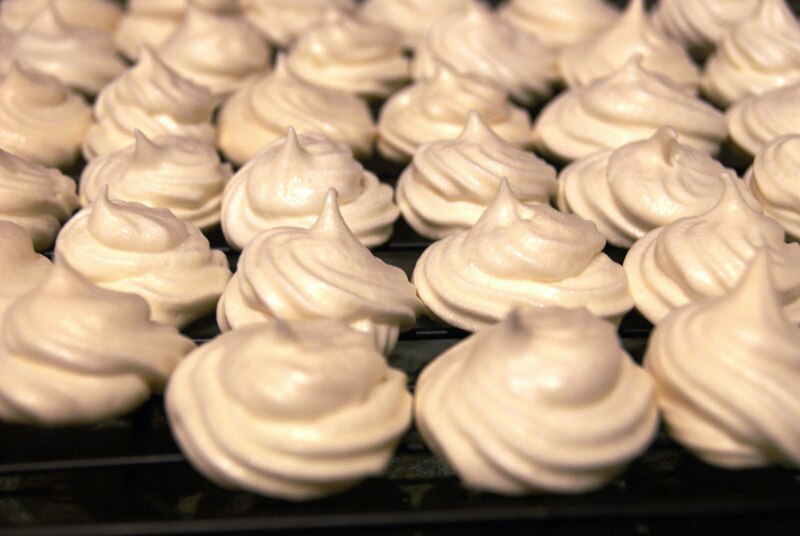 These meringues have three ingredients: egg whites, sugar and vanilla. I really like bananas. Well, I suppose I should clarify. I really like some bananas. I really like bananas that are just barely ripe, the ones that have just turned yellow. As soon as a few brown spots appear, I am no longer so found. 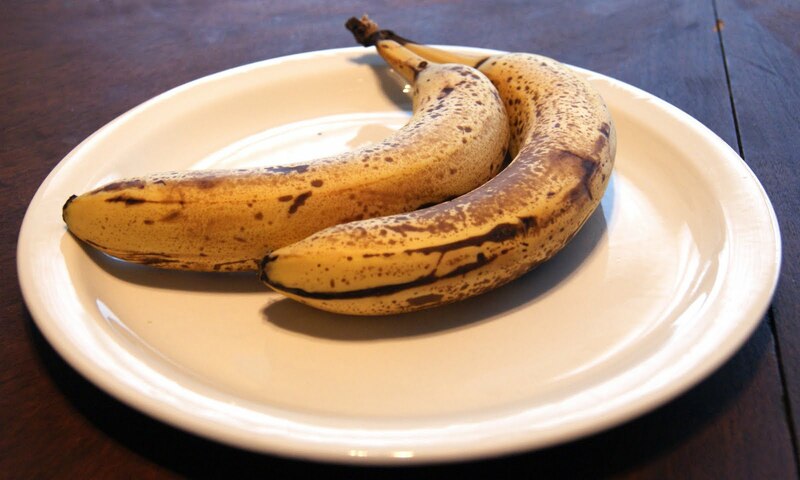 They are good for one thing only, but since that thing is delicious banana bread, I suppose having a few bananas go bad isn't such a bad thing. Last Tuesday was my boyfriend Dan's birthday (happy birthday!). On Saturday he had a party and we got Cuban food for dinner. Dan has been on a Cuban food kick recently. The food was delicious; we got it catered so it made getting ready a piece of cake. Speaking of cake though, that was not catered. I was in charge of making that. I debated several options including a chocolate chip cookie dough ice cream cake and a chocolate rum cake with caramel frosting, but due to the large amount of other food everyone would be eating, we decided to go with a slightly lighter (in texture and richness, not calories unfortunately) cake. A macaroon, to most people (at least in America) is a dense cookies consisting primarily of a mound of shredded coconut, possibly dipped in chocolate. I am against this type of macaroon because shredded dryed coconut is an abomination. 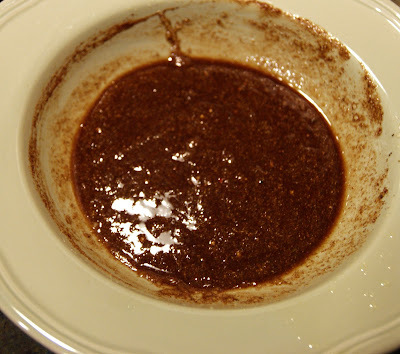 Shredded coconut and celerary are two foods that should be automatically removed from any recipe. 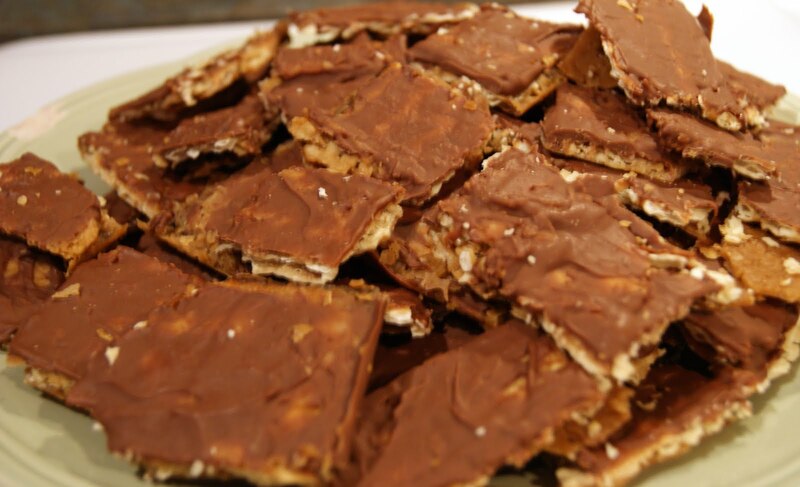 But if you take out coconut from a macaroon recipe, you aren't left with much else. The solution, don't bother with the coconut in macaroons, just remove the 'o'. 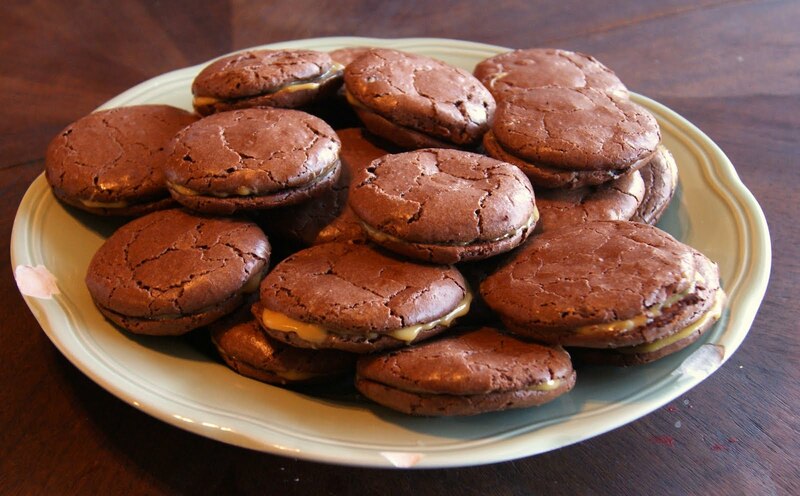 Then you have a macaron, which is the French version and is both as different and superior to the other as the French think they are to the rest of the world. I discovered this difference in spelling from an article sent to me by my lovely aunt. This pizza is the best thing ever. Really. First, the pizza dough is the easiest pizza dough recipe ever, and also delicious of course. And it provides a blank canvas for your wildest culinary dreams. There are infinite variations. And it is really difficult to make something that doesn't taste amazing. Dan and I love to make this. 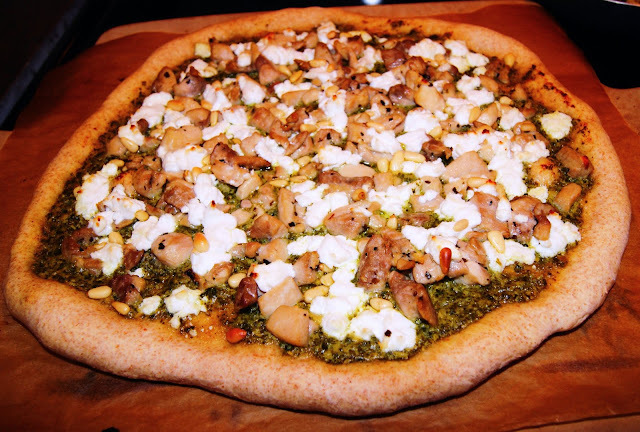 We have made pizza with sopressata and mozzarella, bbq chicken pizza, pizza margherita and now pesto chicken. Every time we make it we're sure we have reached the pinnacle of pizza excellence and then we out do ourselves. 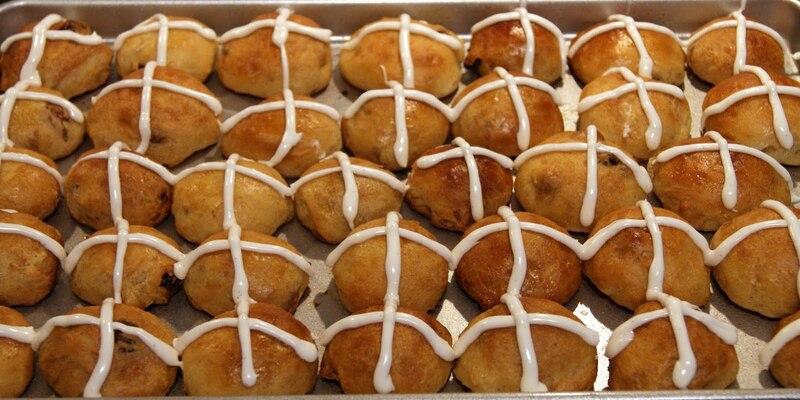 I had never actually had hot cross buns before I made them. I just remember playing the nursrey rhyme tune (hot cross buns, hot cross buns, one ha' penny, two ha' penny, hot cross buns) on my recorder ages ago. I am a pretty decent baker, but I don't cook meat very often and in fact I find it kind of intimidating, which is funny since a lot of people are intimidated by baking and it has never phased me. So I decided to make brisket for a dinner with some friends. It seemed straightforward, but required some advance notice. First off, the night before cooking there is a spice rub for the brisket that sits overnight. 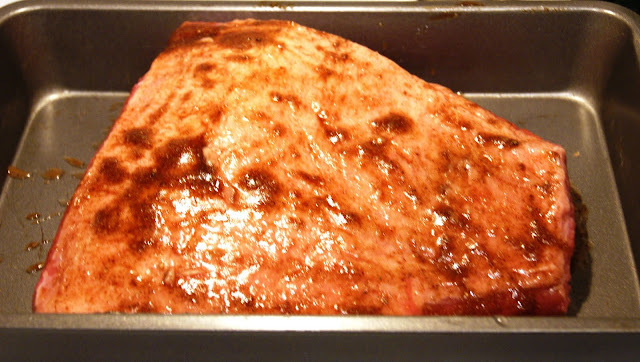 You may be noticing the brisket is very pink. That is because the grocery store only had corned beef (which is brined brisket). I had my heart set on brisket though and I figured the brining would only add more flavor. Passover is the holiday that celebrates the Israelites' escape from Egypt, where they were slaves. With the help of 10 plagues (one of which involved the Angel of Death, who "passed over" the Jewish houses), Moses secured the release of the Jews. However, based on the whole slavery thing, the Israelites were not very trusting of the Pharaoh and worried he would change his mind so they booked it out of Egypt, not even allowing their bread to rise. God parted the Red Sea for them to escape and then let them wander through the desert for 40 years.